With winter around the corner, it is an opportune time to highlight the story of one of our longtime local partnerships between Brooke Kerns and her 31 year old (February 1982) Appendix Quarter Horse, Lady. In Lady’s active golden years, Brooke has learned and thought of some great ways to care for Lady’s changing needs throughout the year. At 3, Lady was bought unraced off of the track in Illinois by a Reining trainer. Then at 4, she was purchased by Brooke’s friend Kathy in Wisconsin for her husband to use as a trail horse. That is where she and Brooke met. Brooke has now been riding Lady for 27 years and has owned her for 20. 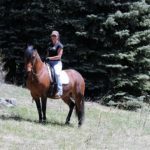 Lady has lived an active life in Dressage, cross-country jumping at pair paces, trail riding and cattle work. 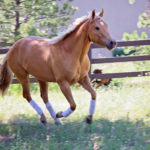 Due to some nerve damage and atrophy to her stifle, she now enjoys trail rides with a flatter terrain and has set aside jumping and cattle work. Brooke limits Lady’s riding time to 2 hours on the trail and 1 hour in the arena. Since age 20, Lady has been on a glucosamine supplement (Legacy) to help with arthritis and a little stiffness. Brooke has found that keeping Lady active and not retiring her helps Lady stay happy mentally as well as conditioned physically. She is currently an amazing school horse for beginner and novice riders, expertly taking care of her students and adjusting to their abilities. Since she was 28, dental changes have been the main aging issue for Lady. Her molars are now not sharp enough anymore to chew hay or grass in the pasture. 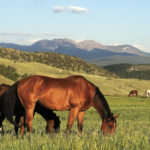 Knowing the importance of being in the pasture and grazing to a horse, Brooke keeps Lady in a grazing muzzle in the warmer months that allows her to get just a few blades through at a time, which she is able to manage with no problems. With regular hay out of the picture, Brooke started feeding Lady equine senior pellets to meet her nutritional needs. At 1100 lbs, Lady gets 10 pounds per day in 3 feedings. Slowly cycling brands of different senior feeds helps to keep Lady from getting too bored. Senior feed alone does not keep Lady busy enough or feeling like she is getting enough to eat, therefore Brooke feeds her a mash made up of beet pulp pellets and hay cubes after she eats her senior feed. This gives her more filling fiber and simulates what she misses in hay. Brooke adds a 3qt scoop of each to 2 gallons of water and lets it soak and rehydrate for 8-12 hours. Of course it is important to mention that Lady eats separately from her 29 year old mule stable mate, Whisky Pete! Winter brings on new challenges with the mash. With the water content and the time it took for Lady to eat it, her mash freezes. At first Brooke tried a heated bucket, but it kept the mash too hot and Lady refused eat it. Brooke then came up with what she calls the “double boiler”. She now puts Lady’s mash in a second bucket (yellow one in the picture). The second bucket goes in after of 1 gallon of water in the heated bucket. The double boiler keeps her mash at the perfect temperature in freezing months. In addition, Lady receives a B-complex vitamin injection ($10) every 6 months that seems to perk up her attitude, energy and appetite. Brooke also mixes alfalfa cubes in Lady’s mash every now and then to vary the flavor. Brooke keeps up all of Lady’s regular maintenance with the farrier, de-worming and vaccinations and it is key to have her veterinarian look at Lady’s teeth and float them if necessary 3-4 times a year. Brooke credits Golden Animal Hospital as being a great resource and partner in maintaining Lady’s health. Lady Khaled is by Thoroughbred Terlago (Terrang X Lady Joy) and out of Quarter Horse mare, Miss Ambrosia (Velvet Top X Sugar Norp). Every horse has different needs, so always work with your veterinarian to make an individual plan for your own aging horse. Heather McWilliams © 2013.